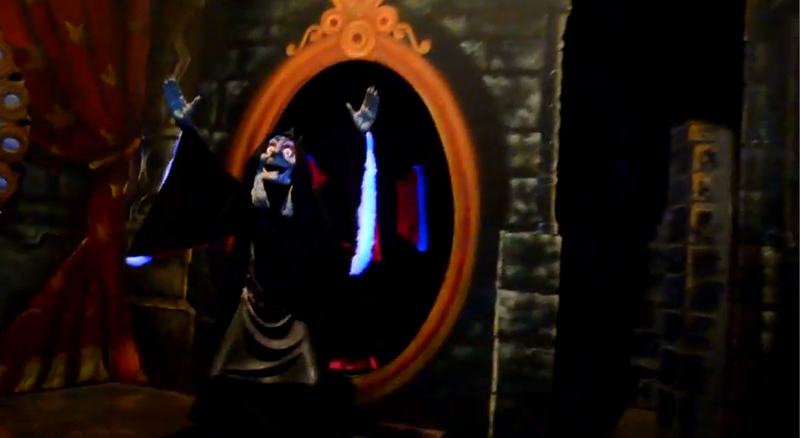 I'm at Walt Disney World today on a whirlwind visit to say "farewell" to Snow White's Scary Adventures. I will be here all day taking photos and shooting video (which I'll post at a later date) until the final guest-filled mine car exits the doors for that very last time. 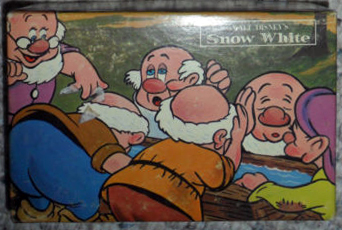 Joining me throughout the day will be the creator of the KenNetti Snow White database, Kenneth Sundberg, who flew in all the way from Finland to ride this classic before it closed. Also here will be Ben Miles along with his with his parents Ron and Sara. Ben is the absolute undisputed record holder for most times aboard SWSA, over 3000 rides! 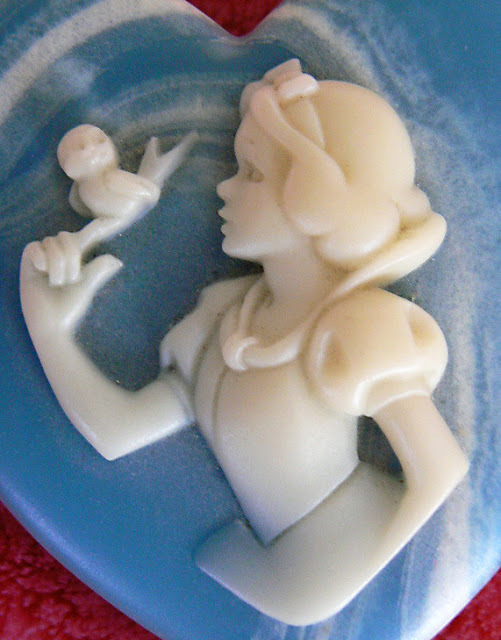 See Ron's blog post today, a retrospective on Snow White and the ride. 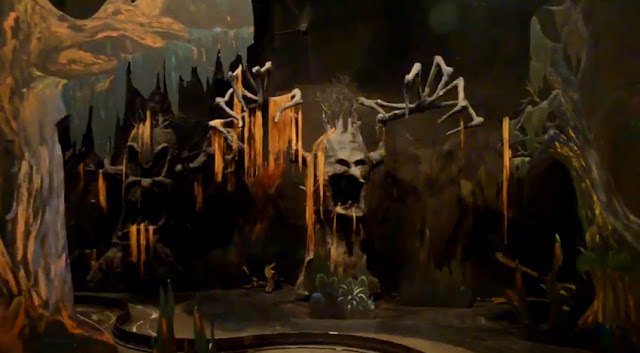 It's a sad day for fans of the Scary Adventures, but at least it has brought a few of us together to experience a piece of history--a ride who's origins stem all the way back to the original 1955 Disneyland opening-day attraction and to Walt Disney himself. 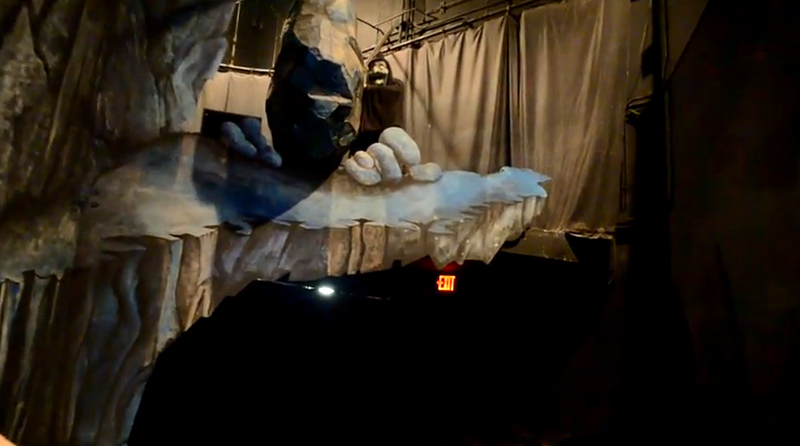 Thanks to Kurt Raymond for the heads-up on this vid. With SWSA going away, this footage is all the more special. It's only too bad the videographer wasn't able to get in his/her own mine car. Screen captures from video by MouseChat.net. 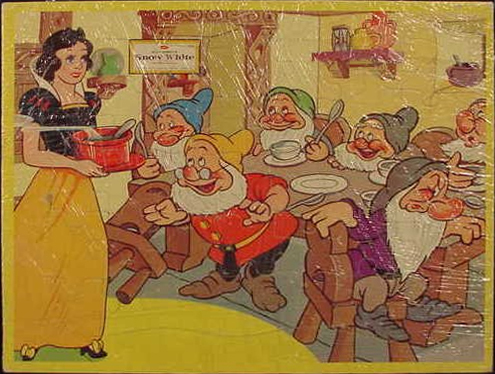 As part of the overall new Fantasyland expansion project that's currently happening at Walt Disney World's Magic Kingdom, it's well known now that the Snow White characters are getting a new attraction in the Seven Dwarfs Mine Train. I'm certainly looking forward to experiencing this ride and its latest coaster technology...although it's going to be awhile before that happens. It's not scheduled to open until 2014. 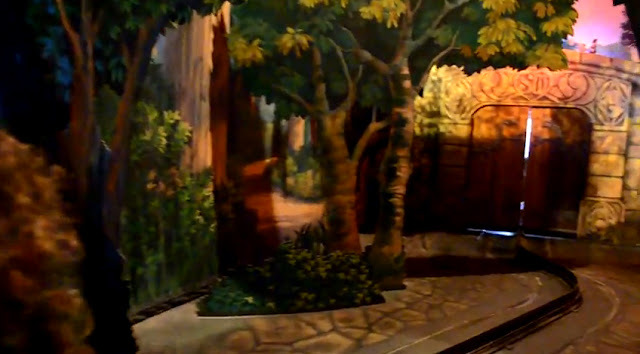 Sadly, the casualty of this expansion is the closure of Snow White's Scary Adventures. 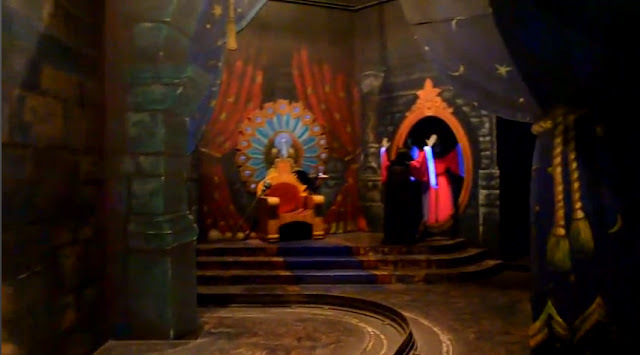 May 31, 2012, marks the last day of operations for this classic 1971 opening-day attraction. 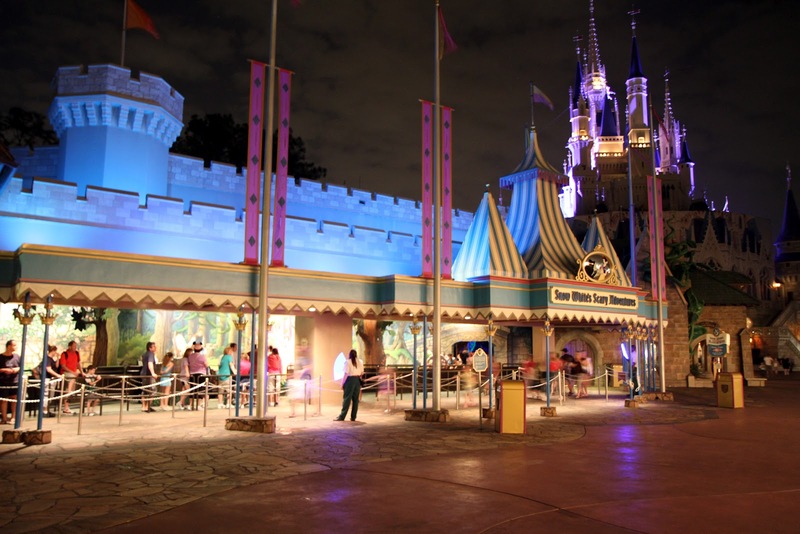 My first trip to a Disney theme park did not actually occur as a child but rather when I was already an adult of 37 years. Yet, the impact of that initial jaunt aboard Snow White Scary Adventures was nothing less than profound for me. Before this inaugural park experience, I can recall having viewed the original 1937 Snow White film only once...and I wasn't even able to stay awake through it all. 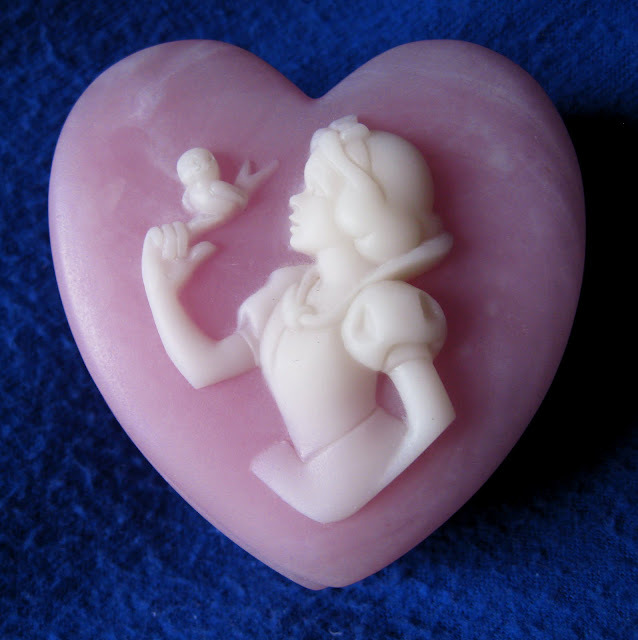 But after this ride, I became what some might describe as a Snow White votary. 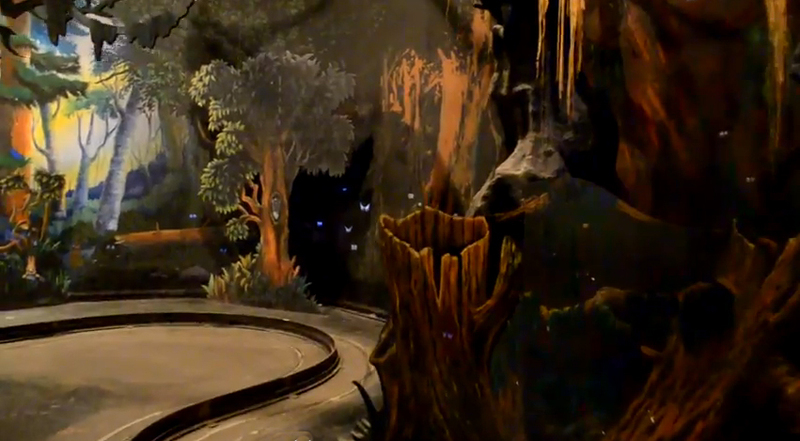 The influence of the SWSA attraction (and of course the film) has been significant to say the least for me. Things change and life moves on, but the Scary Adventures will always be a special memory for me. I will miss it. 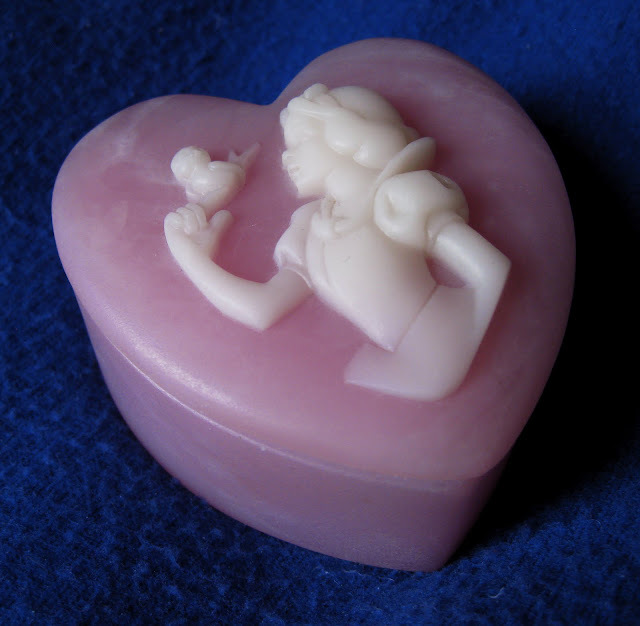 This little Snow White trinket box comes from the collection of Brian Sibley. 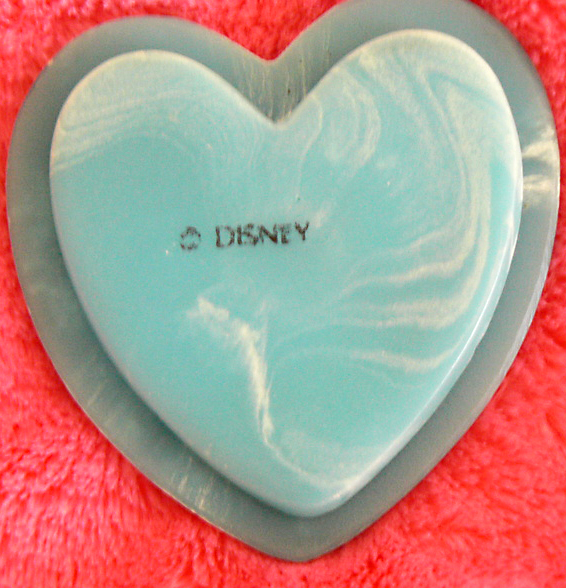 He purchased it at Walt Disney World circa 1980. "It was part of a range of gifts that were on sale in the glass/china shop on Main Street USA, Magic Kingdom." 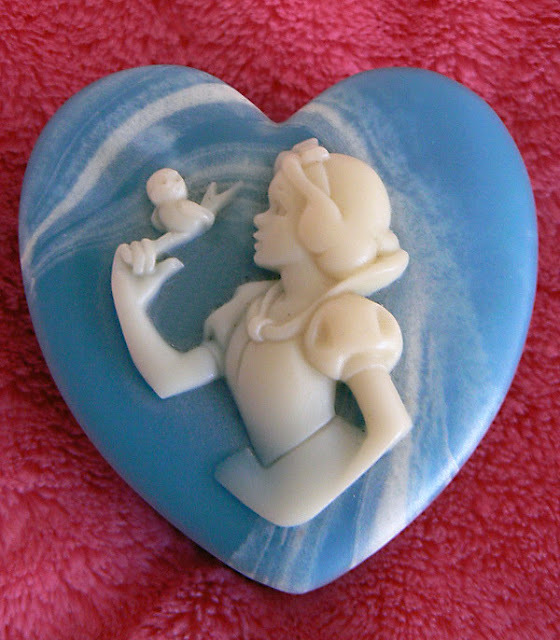 An Incolay/Cameo Onyx box, it is manufactured from a composite of a resin and ground stone which are poured into a mold rather than carved. Measures approximately 2" high and 3" across. Images courtesy of Brian Sibley. Used with permission. Blue Box images courtesy of the Elana Sperber collection. Used with permission. 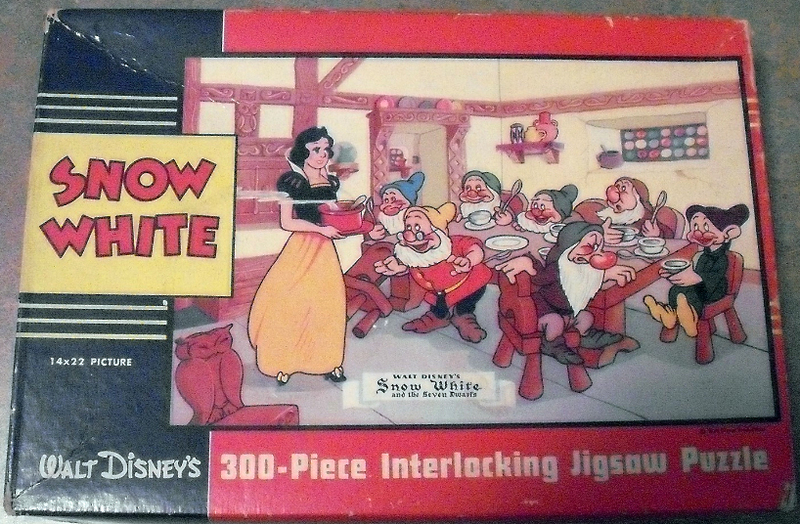 In addition to the tray puzzle seen in the earlier post, the illustration of Snow White at the Forest Edge was also produced by Jaymar as a pocket puzzle. 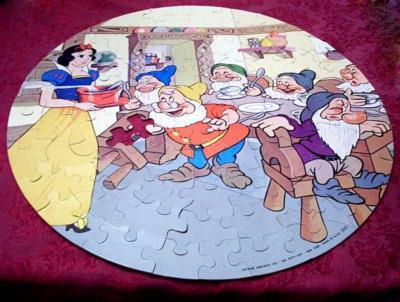 ...and a 100+ piece "Picture Puzzle in the Round", #3032. 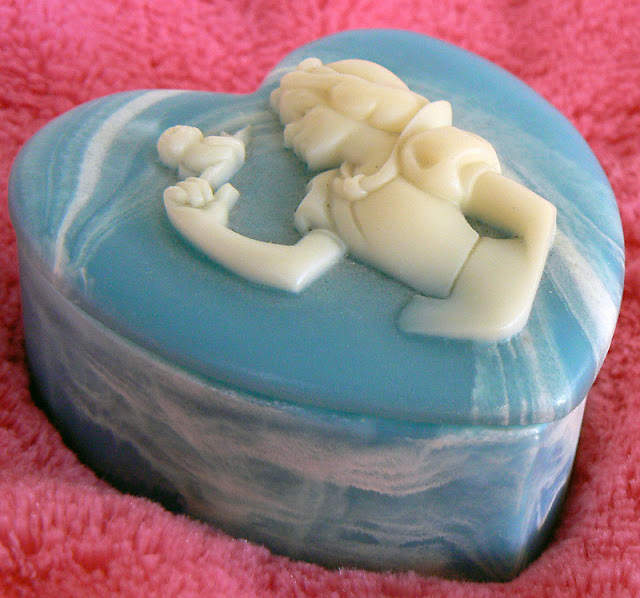 The Washtub illustration was issued as a pocket puzzle too. 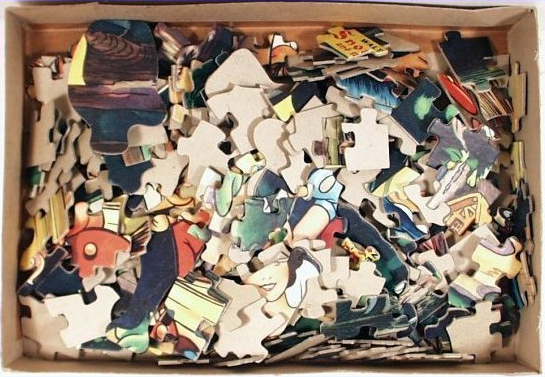 The Soup illustration seen in the earlier post was used in an assortment of Jaymar puzzles including this 300-piece boxed edition. 14" x 22". 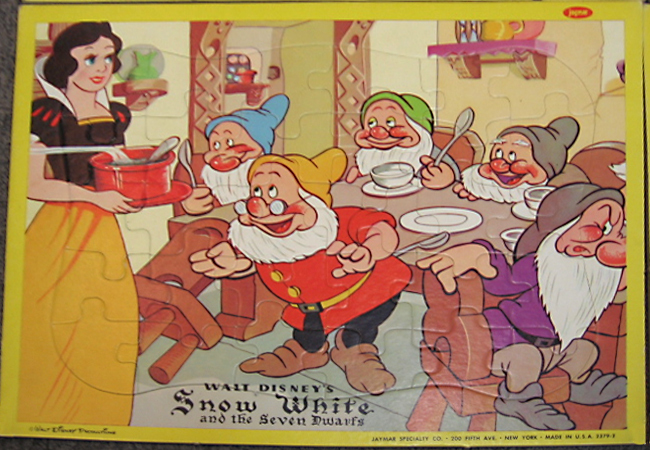 The illustration was cropped for the 1952 red border tray series. Measures 11" x 14", 35-pieces. Marked "Copyright MCMLII Jaymar Specialty Co. New York Series 2596." The red boarder was also produced as #2379-2. 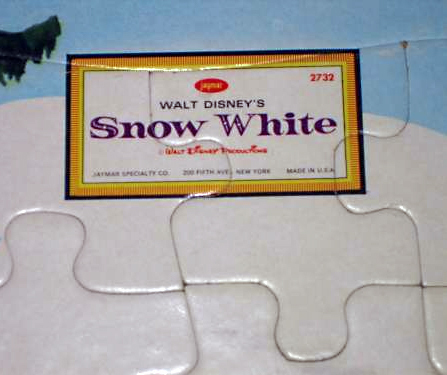 Along the bottom of each puzzle reads: "Walt Disney's Productions" and "Jaymar Specialty Co, 200 Fifth Ave, New York. Made in U.S.A. 2379-2." The same number and markings would appear again in the 4-puzzle set #2379-2, but it had a yellow boarder and red oval Jaymar logo. 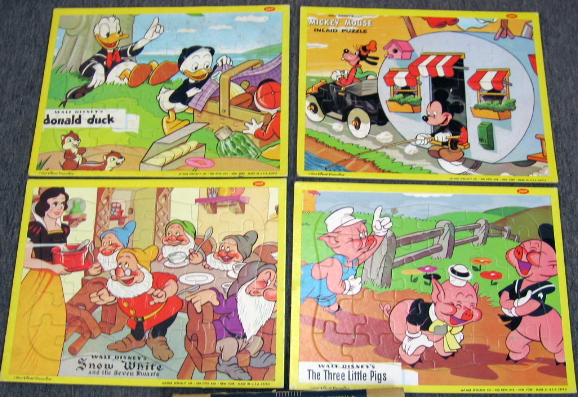 Set included Donald Duck, Mickey Mouse and the Three Little Pigs. Set of four came packaged in this box. The Bantam Pocket Picture Puzzle, #8732. 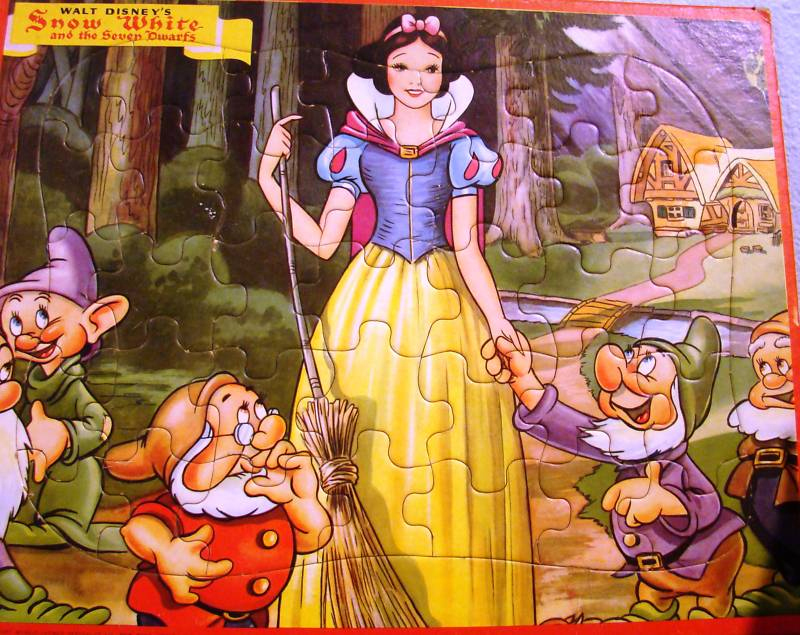 Same pocket puzzle but cropped image. 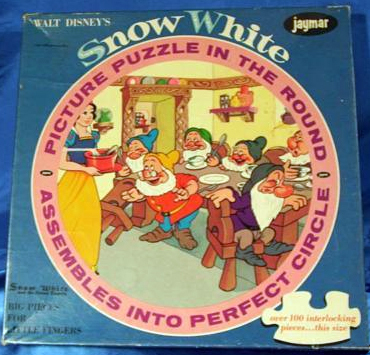 Jaymar also produced a "Picture Puzzle in the Round" series. 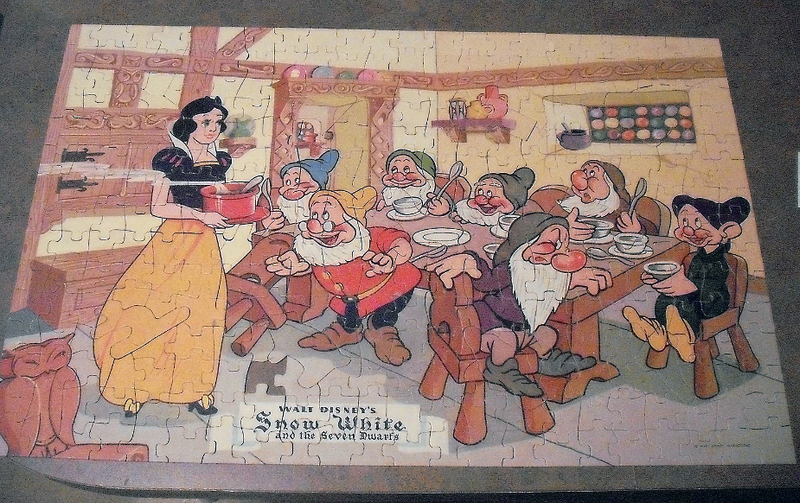 100+ pieces. 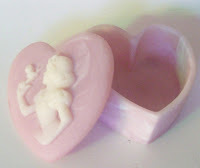 Measures approximately 19" across. 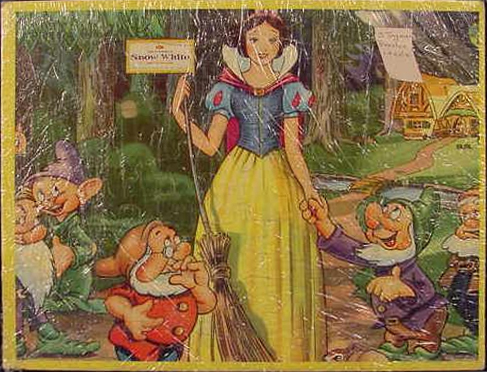 The four Snow White illustrations seen in the previous post were re-used for many years by the Jaymar Specialty Company. They appeared in a variety of different jigsaw designs including large boxed puzzles, inlaid trays, puzzles in the round, and mini-pocket puzzles. 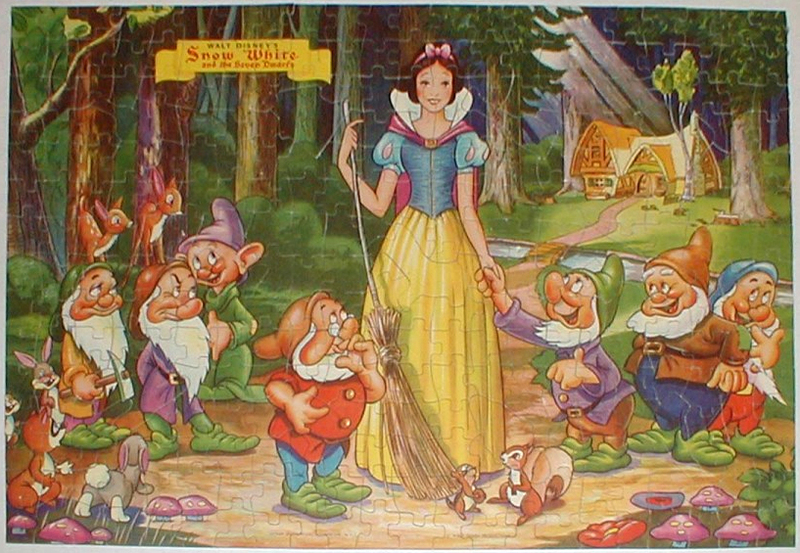 Here's a closer look at the "Snow White with Broom" puzzles. 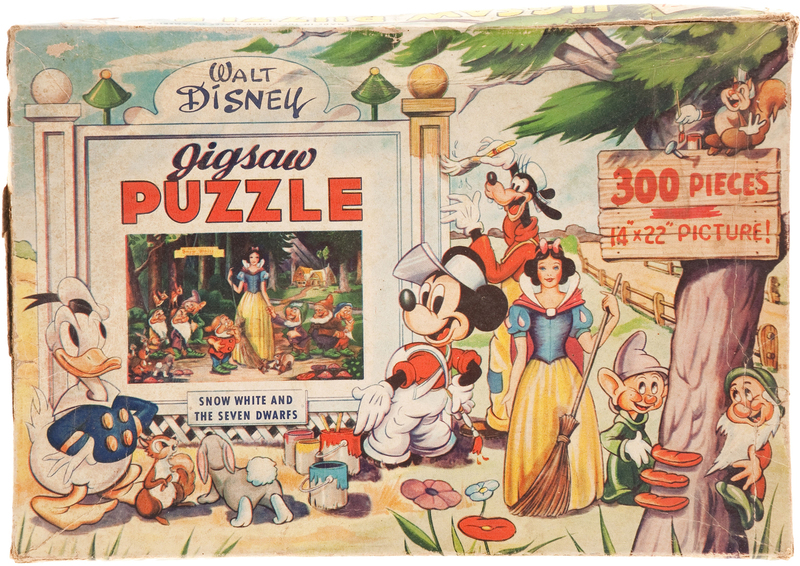 This 300-piece dates from early to mid-1940s and was part of a series of war-time puzzles issued by Disney that also included Pinocchio, Bambi, Dumbo, and Silly Symphony characters. 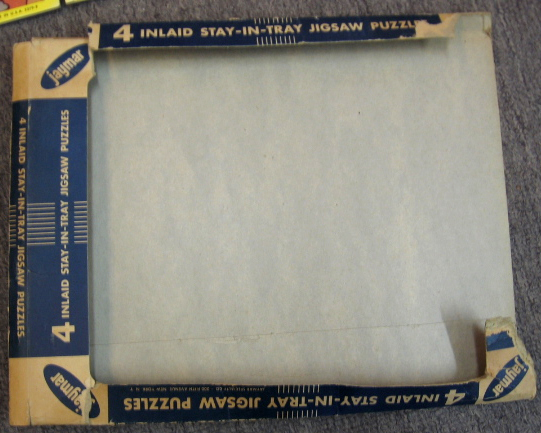 The picture measures 14" x 22" and box is 7" x 10". 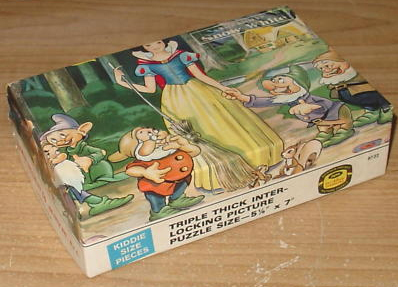 The same 300 piece puzzle also appeared in this box. 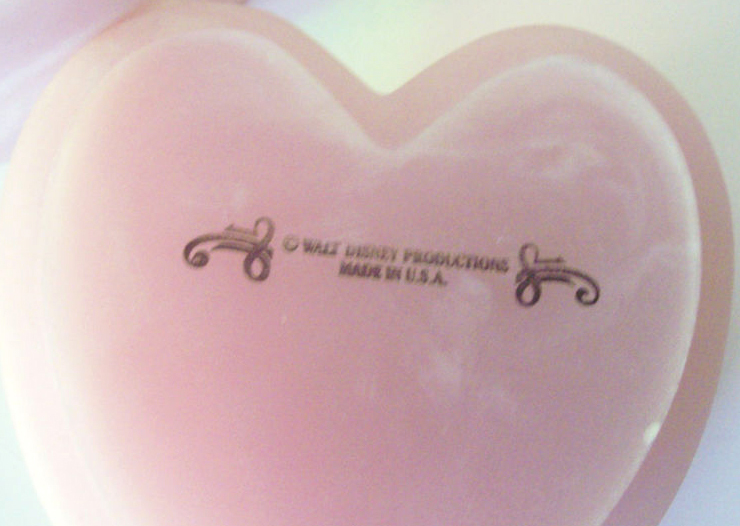 It still has the original 29¢ Woolworth price tag on it. And a 400+ piece puzzle. 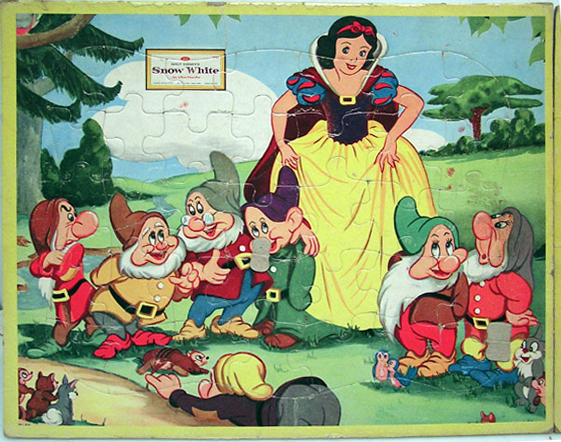 In addition to being included in the set of four 1967 yellow-border tray puzzles (previous post), this illustration was also used in an earlier 1952 version. It had a red border and was marked with the Roman numerals MCMLII. 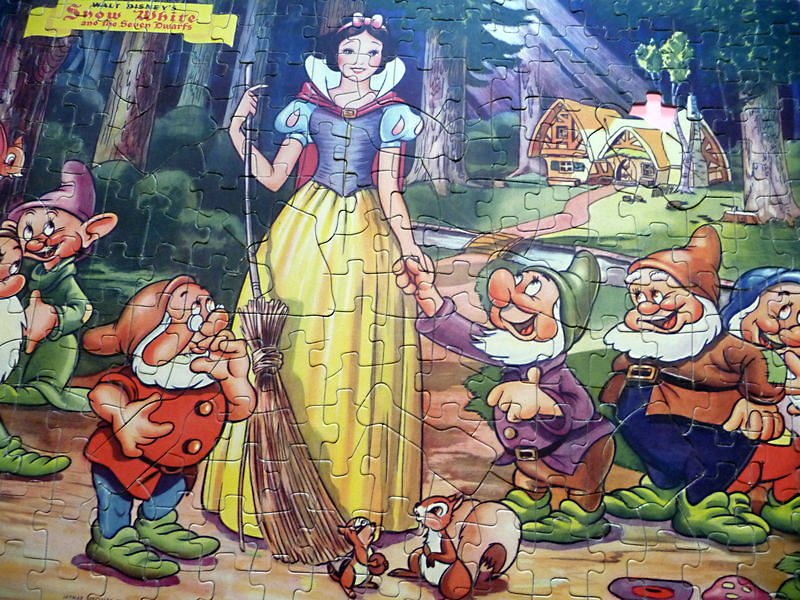 Note the illustration has been cropped from that of the original above. 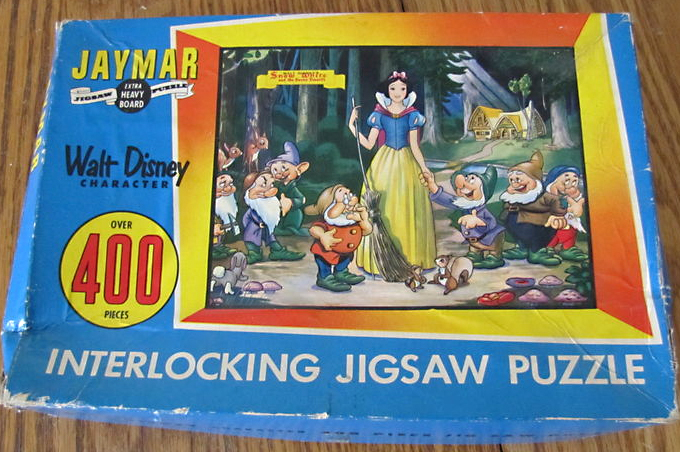 In conjunction with Bantam, Jaymar would produce a number of "pocket puzzles", mini-puzzles measuring 5.125" x 7" in size. The logo on side of box reads, "Bantam Pocket Picture Puzzle" and "Jaymar Walt Disney Characters." Box measures 3.687" x 5.687 " and 1.5" high. 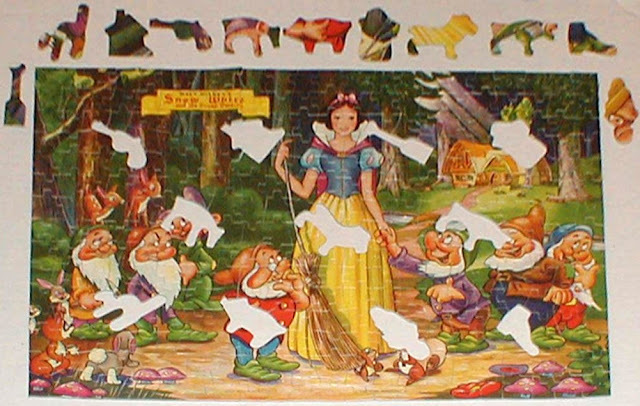 Special thanks to collector Rick Payne for supplying additional information on these puzzles. 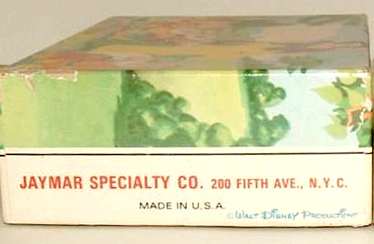 Jaymar Specialty Company manufactured toys from the 1920s to 1990. 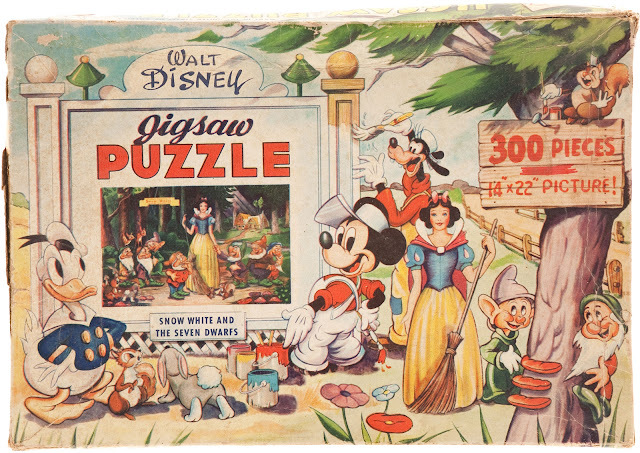 They produced metal toys, wooden toys, toy pianos, and a variety of other child playthings including jigsaw puzzles--lots of them. The following four Snow White illustrations were used again and again over the years in a wide variety of different puzzle types. 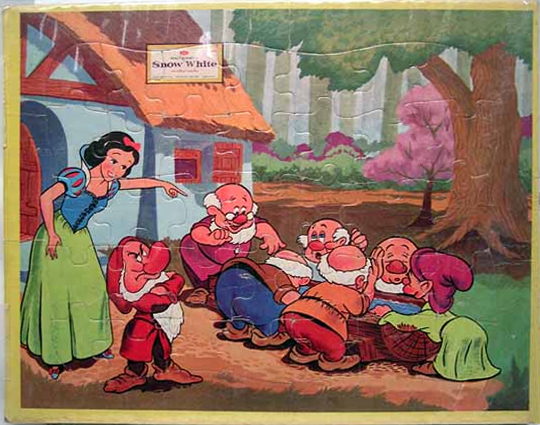 These pictured below date from 1967 and make up the Jaymar series #2732. 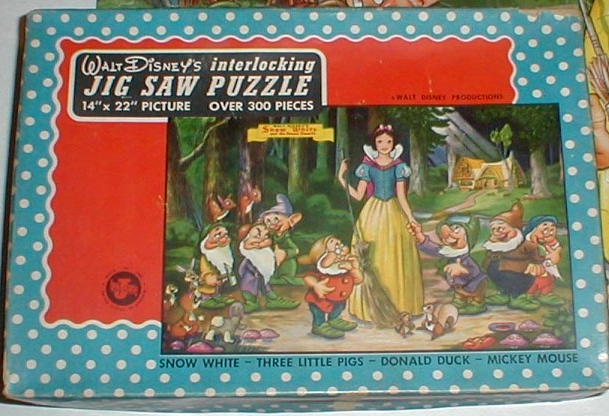 The four 35-piece tray puzzles were sold as a set. Each measures 14" x 11". Retail price was just 29¢. 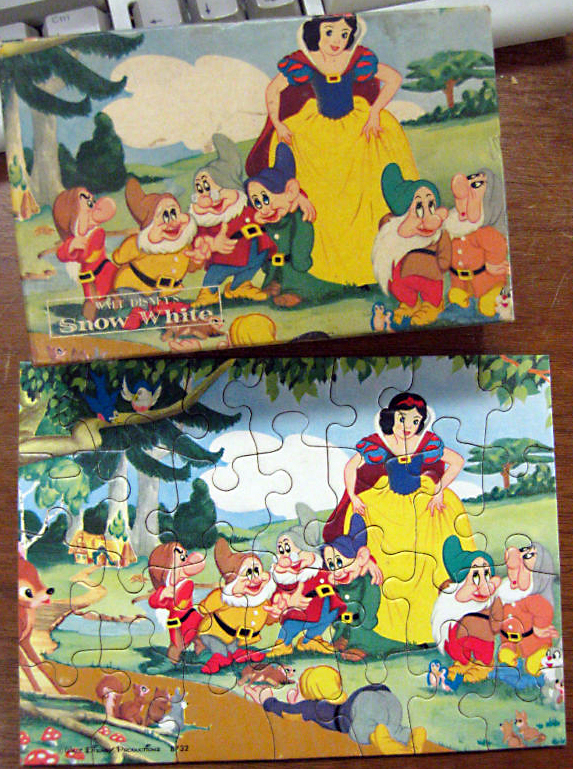 Each puzzle in this 1967 set was framed with a yellow border (earlier editions were red). 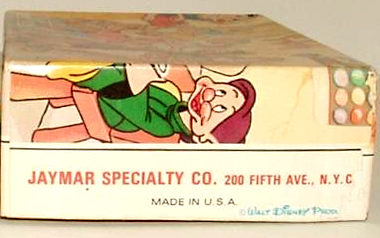 Plus all displayed the Snow White logo box with the series number 2732 and the "Jaymar Specialty Company" address. 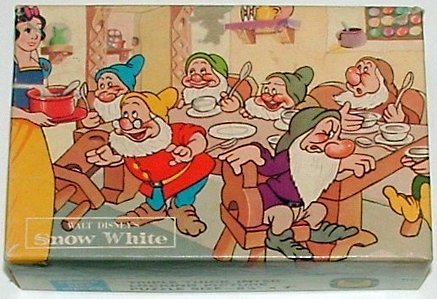 The set was advertised in the Merchandising Supplement of the 1967 Snow White pressbook. 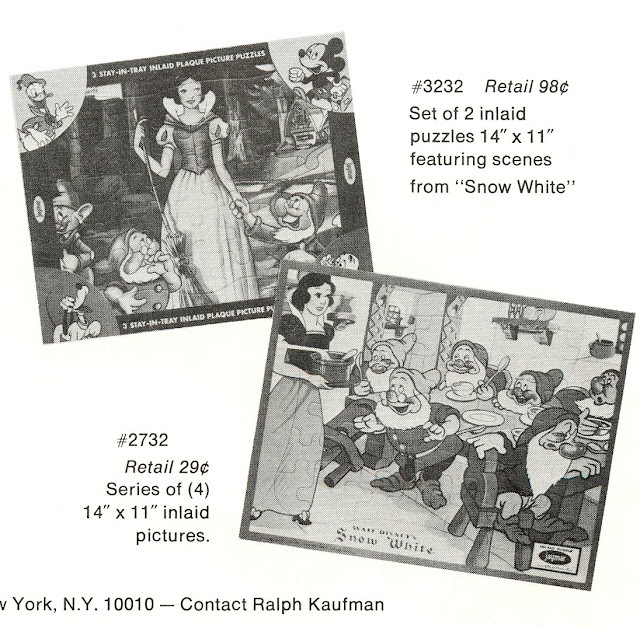 Note that the actual image displayed in the catalog is of an earlier "red border" puzzle that lacks the series 2732 logo box. Plus there was yet another series #3232 which was packaged in sets of two. 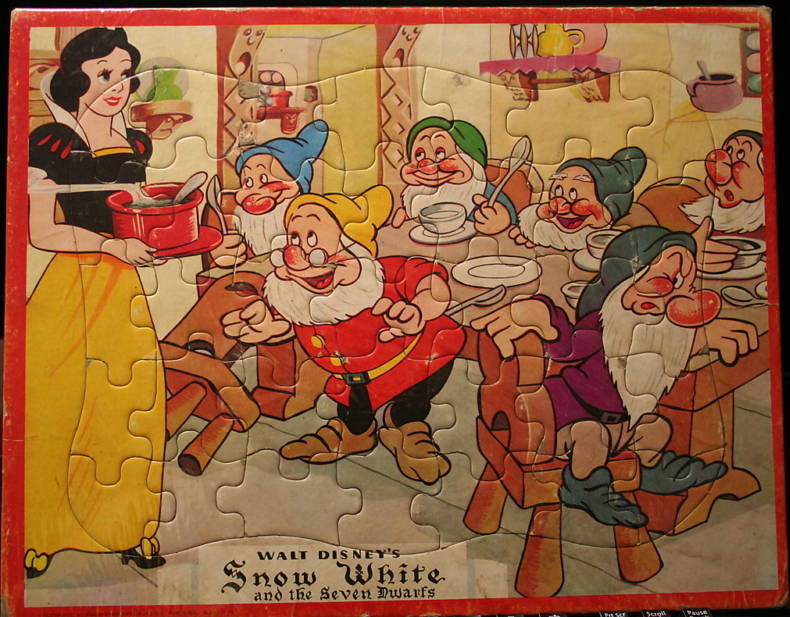 These same four illustrations appear repeatedly in other Jaymar puzzle designs: Snow White with Broom, Snow White with Soup, and the Forest Edge & Washtub puzzles.